A home inspection is an excellent opportunity for buyers to discover unknown problems with their future home. If the inspection reveals the need for significant repairs, you can either ask the seller to address them or you can renegotiate the selling price accordingly. Therefore, home inspections are critical because they help you make an informed home buying decision. Many things are excluded from a standard home inspection. Here are 7 things that aren’t a part of a standard home inspection. Please discuss with your home inspector to understand other things that are not included. Home inspectors aren’t supposed to drill holes in the walls of the house to examine systems enclosed within. 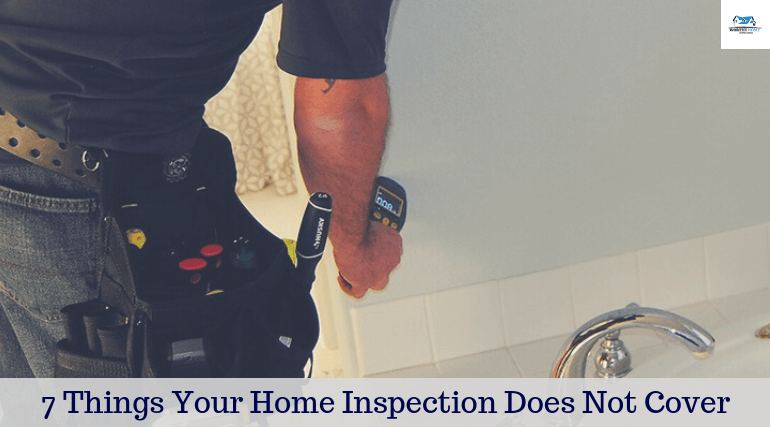 This is because home inspections typically include a visual inspection of the home components. For example, they do check the electrical outlets but don’t check conditions of wires in the wall. The standard home inspection practice does not include reviewing any dangerous substances including asbestos, radon, methane, radiation, formaldehyde, and more. This means that home inspectors do not look for toxins, and contaminants in soil, air, and water. Home inspectors can inform about a roof’s condition, which is an important part of a home inspection. They will observe the roof layer, flashings, skylights, and chimneys for signs of defects. However, they don’t inspect attached accessories such as solar panels and antennas. An inspector’s job involves examining the pipes but checking the septic tank condition is usually not a part of the home inspection. You should consider having a septic system evaluation by hiring a professional before buying a property. Some plumbing issues cannot be visually detected. Though the regular home inspection addresses many issues with the electrical system, it mostly just covers superficial issues, such as service panels, breakers, and fuses. However, for a detailed system review, you should hire an experienced electrician to prevent any future emergencies. Home inspectors might review a pool’s pump or heater to verify if it’s working, but their job doesn’t usually include evaluating the pool for cracks, leaks, and additional problems. You may consider hiring a professional pool inspector if you want a detailed review of a home’s pool or spa. Although home inspectors will examine the home’s foundation for cracks and other flaws, they won’t inspect the ground beneath it. This might not be a significant problem unless you are on a hillside or in a location where sinkholes or flooding commonly occurs. This can be managed by hiring a geological inspector. Before buying a home, you want to be confident about making an informed investment decision. Contact us for general and specialized home inspection solutions to ensure complete peace of mind.